What are porcelain veneers and why is porcelain the preferred material? 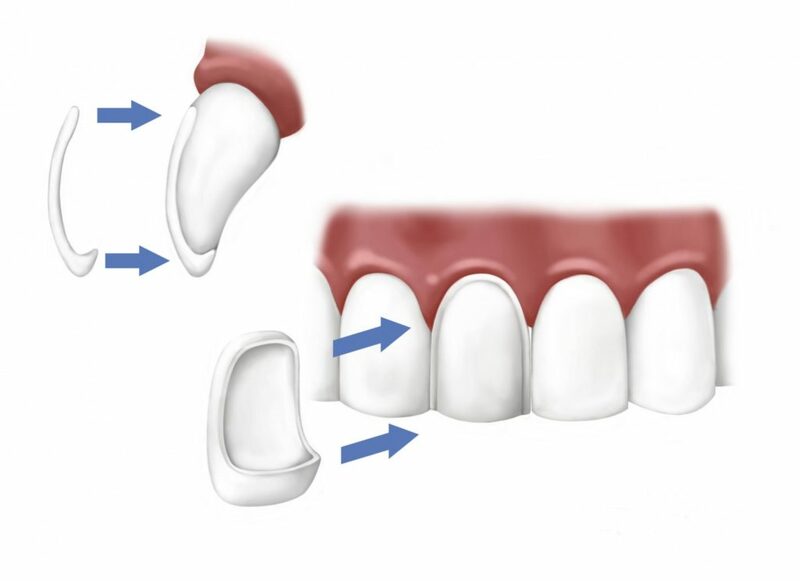 Porcelain veneers are a cosmetic and functional solution for a wide variety of dental concerns. Incredibly thin, custom-tailored, tooth colored shells that bond to existing teeth, veneers provide completely unnoticeable new tooth surfaces. We exclusively use porcelain veneers at Affordable Dental Care PC because they are slimmer, stronger and far more similar to a natural tooth surface than other veneers. Your veneered teeth will form your own, completely natural smile – just whiter, straighter and more symmetrical. The application process is minimally-invasive, as porcelain veneers are so thin that very little natural tooth needs to be removed. Little to no anesthesia is required for the application. Porcelain veneers act as a new layer of enamel on teeth and are the most effective solution for those suffering from extreme tooth sensitivity. You and your dentist will determine the shade and shape of the new teeth as a tea, giving you the opportunity to permanently whiten, straighten and fill in uneven tooth spacing. Porcelain veneers can give you a more comfortable bite, by slightly reshaping tooth surfaces so that your jaws rest together more easily. As the veneering process is largely non-invasive and porcelain veneers can be applied in just two office visits, the porcelain veneers are the ideal dental solution: a quick and simple restoration of cracked, uneven, or discolored teeth that lends the teeth strength as well as beauty. Due to the advancement of dental technology it is now possible to attach porcelain veneers to teeth that may look crooked, uneven or discolored. This astounding technology allows the dentist to place laboratory made porcelain facings directly onto the surfaces of front teeth. The results for these are nothing short of amazing and it has become a viable way to hide an individuals dental imperfections such as broken, stained, mis-aligned or chipped teeth. Mask imperfections in their smile. Cover missing gaps and spacing. Preserve the natural tooth structure. Overcome a confidence problem created by an unsightly teeth or smile. You can maintain a natural perfect looking smile from veneers that’s applied and are custom fitted an created in a lab to fit precisely over your natural teeth. The result is an astounding smile, which looks natural and is comfortable. TO DISCUSS VENEERS AND TO SEE DR. PINKHASOVA’S GALLERY OF PREVIOUS PATIENTS WHO HAVE HAD THEIR YOUTHFUL SMILES RESTORED, SIMPLY SCHEDULE AN APPOINTMENT FOR CONSULTATION ON OUR WEBSITE OR BY CALLING US DIRECTLY AT (718)897-3434.